Sunrise is excited to partner again with William Rawn and Shawmut Construction on this elegant addition to the Bigelow Chapel in Mount Auburn Cemetery. This revitalization of Bigelow Chapel is being done as part of Mount Auburn’s long-term plan to improve its entry precinct and expand its options for end-of-life services. 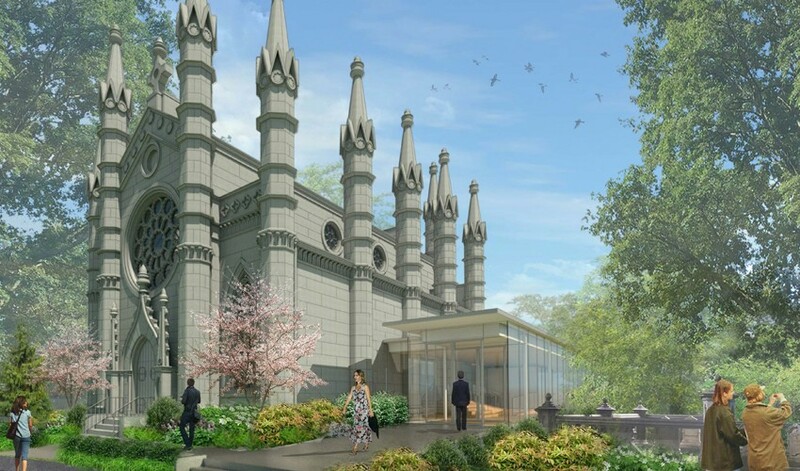 The restored chapel will include a modern, state-of-the-art crematory; new gathering spaces for private events and functions; a handicap-accessible entrance and restrooms; and a fully-restored 19th century stained glass rose window. Sunrise has been contracted in a design-assist format to erect the mullionless glass walls, custom stainless-steel panels, skylight, aluminum curtainwall, and interior glass and glazing.